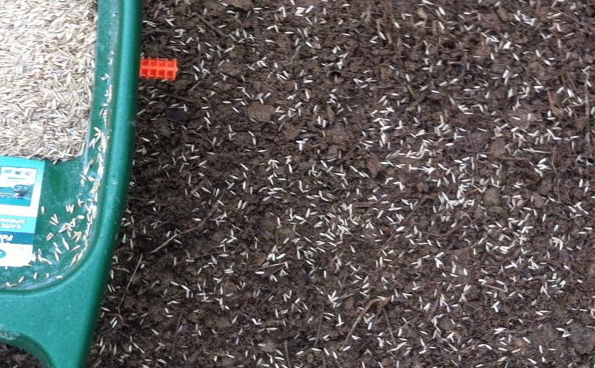 10 steps for seeding a new fescue lawn in the fall – Johntheplantman's stories, musings, and gardening. 1. Run a tiller over the area and rake up the dead stuff and trash. 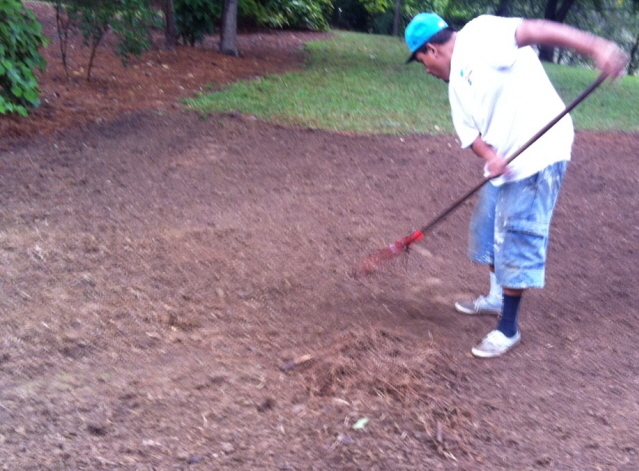 The tilling should only be an inch or two deep but it should be thorough and pulverize the soil. 2. We like to use a leaf rake to get up all of the unwanted trash. 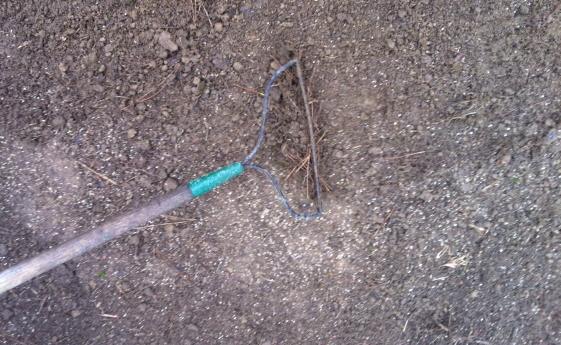 If applied carefully, a leaf rake will also level the soil and leave it ready for seed. A loose surface is preferred. 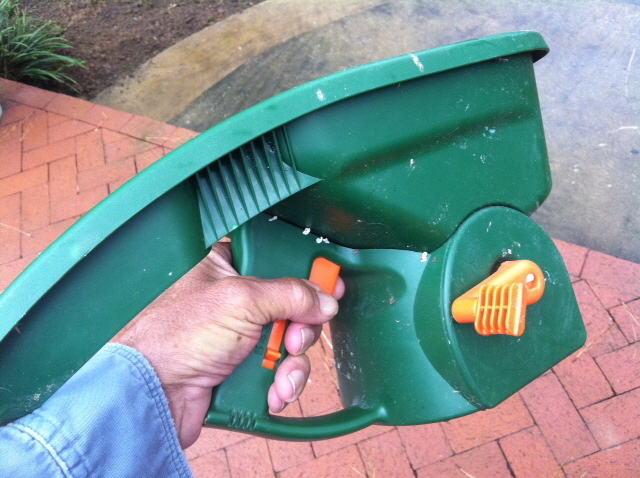 Use a heavy yard rake for filling holes or moving high spots. 3. 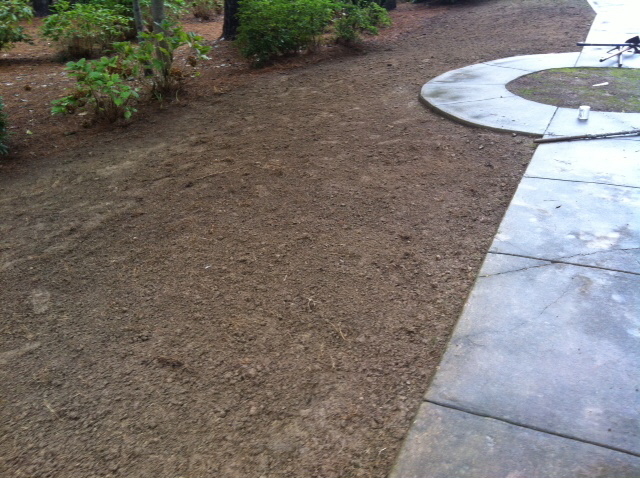 The area is ready for seed. The raking leaves a corduroy texture. The seeds can fall into the low parts. 4. There is a difference between “turf-type fescue” and pasture fescue seeds. Several brand names are available but what you want for the yard is “tall turf-type fescue”. It is, of course, more expensive, but well worth the extra money. Rebel is a good brand that I’ve used for a number of years. 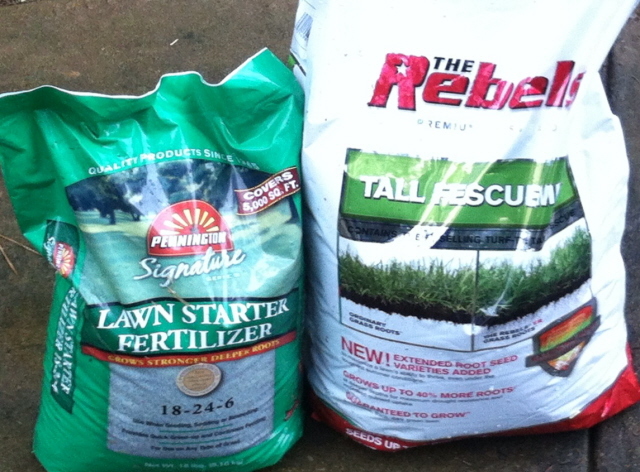 Turf-type fescue seed and a good starter fertilizer. 5. I keep buying these seed spreaders and they keep messing up on me. I can’t find the old bag type that had a neck strap. I guess they don’t make them any more. Anyway, I’ll try the seed spreader. 6. Yep. Just as I figured, the seed spreader jammed. I finished and enhanced the seed spreading by throwing the seed out with a careful side-armed movement. I’m beginning to think that hand spreading gives you a better job, anyhow. Here is a picture of the seed on the ground. It’s applied a bit on the heavy side but I like it that way. A lighter application would suffice. This is also time to spread the fertilizer lightly over the area. 7. I feel like this is a most important step. 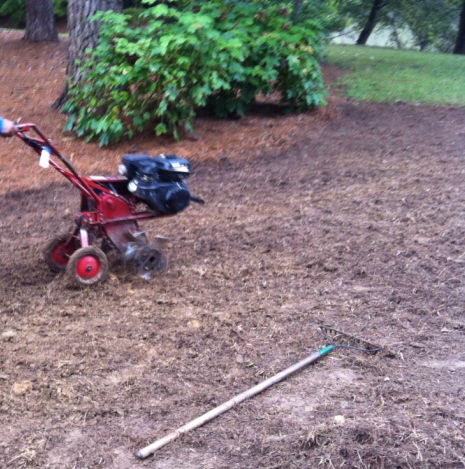 We run a rake over the ground and seed which mixes the upper layer of soil with the seed. This step requires a light touch. 8. 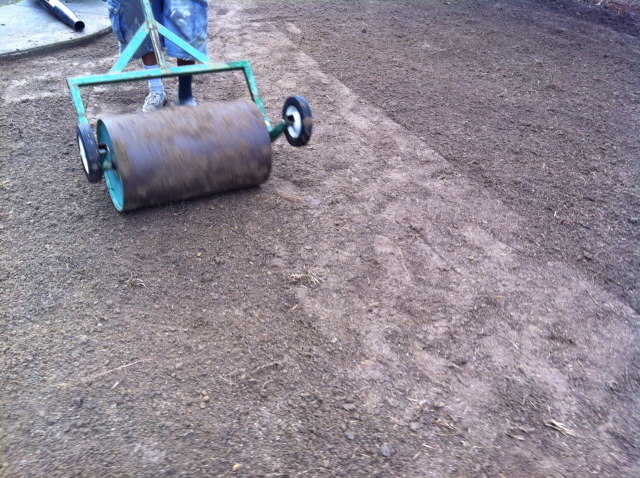 Running a roller over the seed bed eliminates air pockets and bonds the seed and soil mixture. This step could probably be eliminated but I think it is important. It’s a feeling I get. I generally follow those feelings. A roller will pack the soil, mash out air pockets, and level things out. 9. Wheat straw. I repeat, Wheat straw—not hay—is applied. This will insulate the area, help to retain moisture, and minimize erosion. 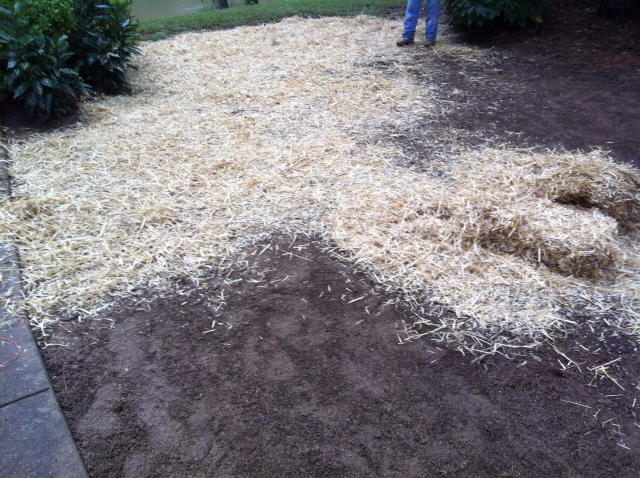 Apply wheat straw to the seeded area. 10. Now all you add is water. The soil should be kept moist–not wet. It helps the seed to germinate if you go out on the patio every evening and “stare it up.” To do this, get a nice drink, maybe some cheese crackers, and watch the seed bed for a while. 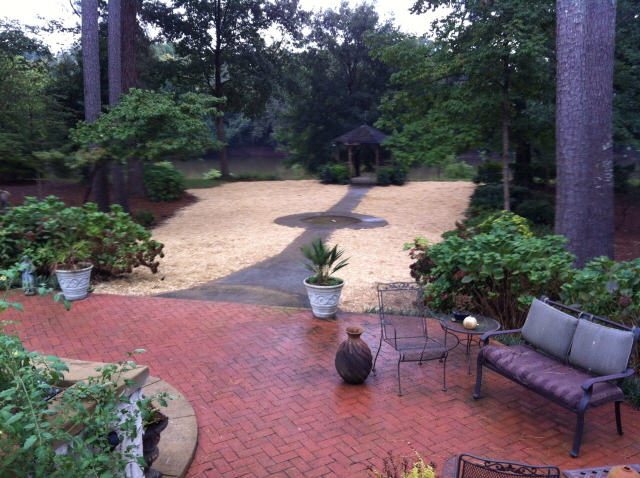 The fescue seeded yard is ready for you to “stare it up” The area should be green in about two weeks. Thanks for visiting John the Plant Man. 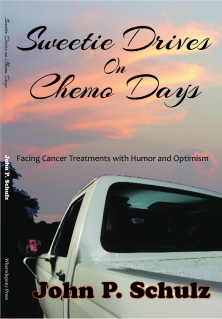 You may be interested in another article on choosing the right fertilizer. Click here. Your handy advice comes just in time, especially the “stare it up” step. I have tried the “stare it up” method on various gardening projects with little success. Might be the choice of drink….not sure. It is a nice, relaxing part of the process, so I do benefit from it. I have found a few of the old bag seeders at estate and yard sales.